At Dead Broke Farm, we love horses, and we find it difficult to turn our backs on horses who are malnourished, untrained, injured, unwanted, abused, slaughter-bound, or in need of basic hoof or veterinary care. As a result, we have rescued more than 100 horses since 2004. We have nursed them back to health, rebuilt their trust in humans, and given them a purpose in life... to delight all those who come in contact with them. These horses are an inspiration to everyone they encounter, so we'd like to share some of their stories with you. I was emailed by a friend who said there was a horse at the Harnett County Animal Control that was in bad shape and needed someone to adopt him. We went to the animal shelter on Oct 17, 2013, and were appalled at the condition of the horse; he was emaciated and had rain rot, so of course, we brought him home to our farm. We named him "Chance" for 2 reasons: 1) We felt like he deserved another chance at a happy, healthy life, and 2) there was a chance he wouldn't make it. Horses who have a Body Condition Score of 1 on a scale of 1 - 9 (like Chance), have a 20% chance of dying due to the irreparable damage done to their internal organs, especially the heart, lungs, liver, and kidneys. In other instances, they succumb to the refeeding syndrome which causes heart, liver, and kidney failure. So we were very careful to get Chance's bodily functions moving again with frequent feedings of alphalfa hay 4 times a day until the middle of the second week when his system was capable of handling small quantities and frequent feedings of senior pelleted feed. When his body was able to handle it, we gave him a mineral block, hoof care, vaccines, and dental care. Initially, he was too weak to risk introducing viruses into his body or sedating him to have his teeth floated. Chance is only 8 years old, but he had lost 8 teeth already as a result of severe malnutrition, which made his rehabilitation even more challanging. Despite all those challenges, Chance made a full recovery. Chance is pictured above after just 9 weeks at our farm. It turned out that Chance was holding out on us. Due to his debilitated state, he had withdrawn his testicals up inside him, so Animal Control told us he was a gelding. After about 2 days at our farm, his testicles dropped. It turns out he was a stud. We had him gelded on Dec 27, 2013, so that he could live a productive social life with the rest of our herd. As of today (Nov 19, 2018), Chance is now 13 years old and still here with us at our farm. 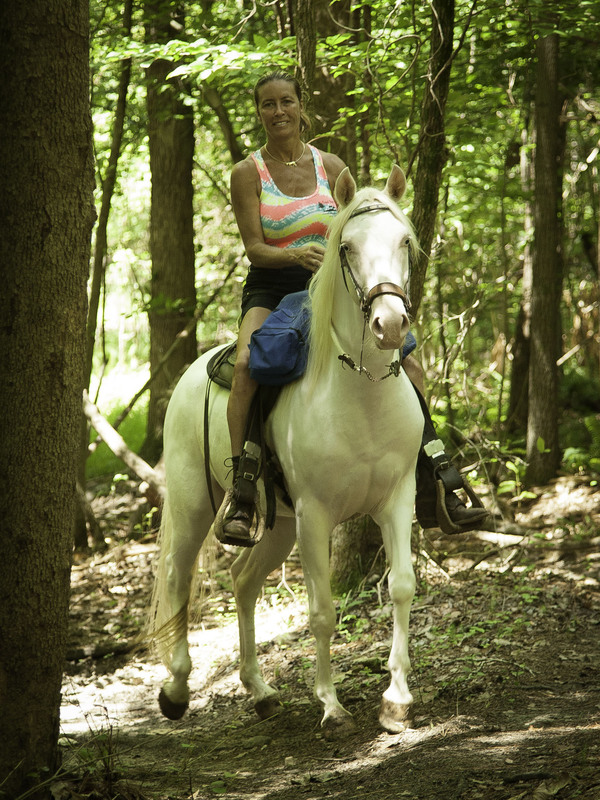 We broke him to ride, and he now takes novice adults and children ages 6 and up riding on our trails. Princess is a mustang who was rounded up and sold by the Bureau of Land Management (BLM). She was separated from her family and removed from the only life she'd ever known. She ended up in the hands of a horse trader that bred her, but neglected to feed her sufficiently or de-worm her. She had her foal and continued to lose even more weight while nursing her newborn filly. When we bought her (for ten times the price that they can be purchased from the BLM), she was very thin, nervous, and distrustful of humans. She had not only been neglected but abused as well. 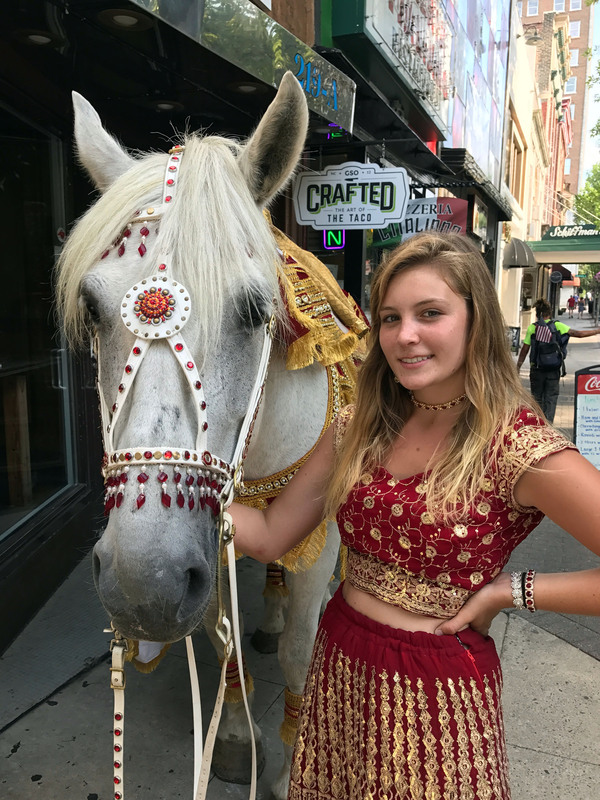 We fattened her up, won her trust, trained her to ride under saddle, and now she is one of the children’s favorite horses because she is so stunningly beautiful and gentle. Booger is another one of our rescue horses. He's the little one on the left in the photo above. He's the same age as the foal beside him, but he should be much bigger than the other foal because Booger is a big draft breed, while the other foal is a normal size breed. Booger had been with us for about 3 months when this picture was taken, so you can only imagine how emaciated he was when we first got him. We purchased Booger off of an online horse auction site. He was pitiful with a huge belly and hocks (the knees of his hind legs) that touched because he was so thin. He was being sold “as is”. He was a five-month-old orphan who was being kept in a tool shed! We drove to Maryland to pick him up, and learned that he also had infection in his muzzle. The vet came to examine him the following day and told us to prepare ourselves in case he didn’t survive. She gave him a body condition score of a “one” on a scale of 1 to 9 with 1 being a horse on the brink of starvation and a 9 being obese. His belly was bloated from worms, he had infection in his face, his muzzle and jaw was disfigured from over-calcification due to him eating whatever dog food he could scrounge up off the floor of the tool shed, and the insides of his hind legs were raw as a result of his legs rubbing together when he walked, because he had no muscle or fat to make his legs position themselves normally. It took more than a year for Booger to look like a horse rather than a camel, but after another two years, he began to actually grow. He grew to 16 hands and weighs about 2,000 lbs. Booger’s growth was stunted, so he will probably never reach his full potential to be a 17 hand, 2,300 lb Belgian draft horse, but he’s still very beautiful and dear to us. We named him Booger because he was so pitiful looking. We unconsciously kept calling him “our little Booger”, and the name stuck. Patches was a fighter, and he pulled through after a few scary incidents with Colic caused by the medication prescribed to help fight the inflammation in his leg. Luckily, there was only minor damage to the cartilage in his left hock, and he was sound. We started him under saddle, and he took novice adults and children riding our farm. We kept Patches his whole life until he twisted his intestine and succumbed to Colic in the summer of 2018. We miss him terribly, but I know he was loved and well taken care of for the remaining 16 years of his life. He is pictured above in 2016. Bo was our first rescue horse. Bo was 5 ½ months old when we bought him from a Pregnant Mare Urine (PMU) farm in Canada. The PMU industry purchases the urine from pregnant mares to make a hormone replacement therapy for women going through menopause. The mares live out their entire pregnancy in slip stalls so small the horses can’t lie down or turn around. The foals are unwanted by-products that have to be dealt with. Many foals don’t survive the unsupervised birthing process or are destroyed by the farmers because they are unwanted and costly to raise. Those who do survive are weaned from their mother’s milk at just three months to bring the mares back into season sooner. Babies may not survive because they don’t get teeth for grazing until they are five months old, which is why they are normally left with their mothers until they are 6 months old. The foals who live are usually sent to feed lots where they are fattened up, and when they reach 700 lbs or 1 year of age, they are sold to slaughterhouses where they are packaged for human consumption in countries like Japan, China, Europe, and Germany where horseflesh is considered a delicacy. Bo was one of the foals fortunate enough to be purchased by the Foal Adoption Network, Inc. (FANI) and put up for adoption. (For more information on the PMU Industry, visit Saving Horses, Inc's website.) After being prescreened and approved as an acceptable owner, we purchased Bo from FANI for the price that the meat packers would have paid plus shipping from Canada ($850 in total). We drove to New York to pick him up from a foster farm where he had stayed until being adopted. Bo, like all the other PMU foals, had never been handled, so he was wild and fearful of humans. Today, Bo is still healthy and happy. He delighted riders with his mischievous antics on the trail for 12 years on our farm. Bo is a 18.1 hand black Percheron weighing nearly 2,500 lbs. After having him for 14 years, we sold him to a very nice lady who absolutely fell in love with him, but he served an important role at our farm because he is one of twelve draft horses we own who are capable of carrying riders up to 450 lbs, so that we never have to turn anyone away or insult them by asking them their weight in public. When race horses' careers come to an end at the "ripe old age" of four, they are often sold to kill buyers who ship them to Canada or Mexico to be slaughtered and processed for human consumption. Even though Americans don't eat horse meat, it is a considered to be a delicacy in other countries such as Japan and Europe. So a disproportionate number of Thoroughbreds and Standardbreds (who pull the sulkies on the track) are slaughtered each year even though they are healthy in every respect. Tommy is a Standardbred we got through Horse Rescue United (HRU) along with 2 other Thoroughbreds named Valentine and Gaitor. HRU is a horse rescue organization committed to saving the lives of former race horses and other slaughter-bound horses. 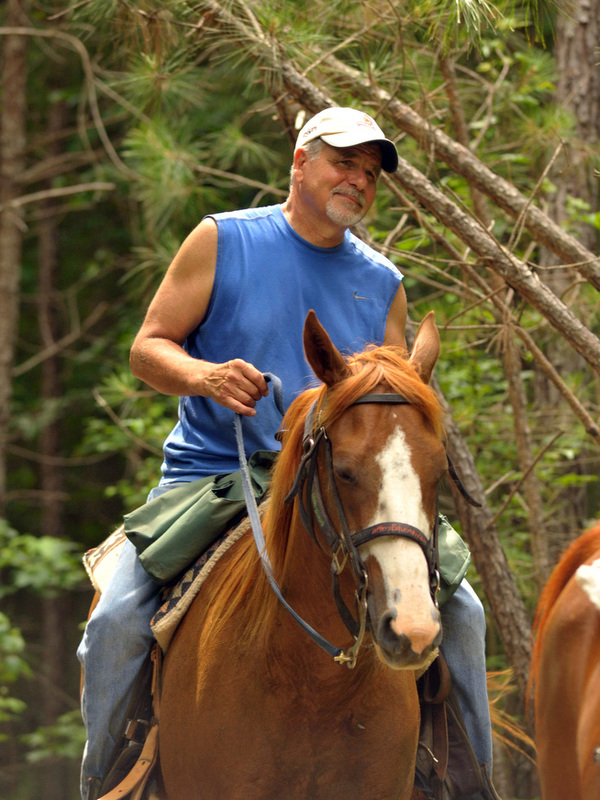 Tommy is still with us today and takes novice adults and children ages 6 and up riding on our trails. We bought Destiny from a horse auction in Oxford, NC. She was suffering from a hernia where her umbilical cord had been. Destiny was already a year old, and the surgery should've already been done. We bought her for a pittance, brought her home, and had the vet perform the surgery. She's 10 years old now, broke to ride, and "healthy as a horse." I cry every time I see this slaughter footage, and I think you will too, but it's the ugly fact that it will be the fate of more than 120,000 American horses each year that motivates me to save every horse I can from such a despicable end. We'll be happy to show you these wonderful horses, tell you their stories, and allow you to ride them when you visit our farm. So come on out and experience these awesome horses. 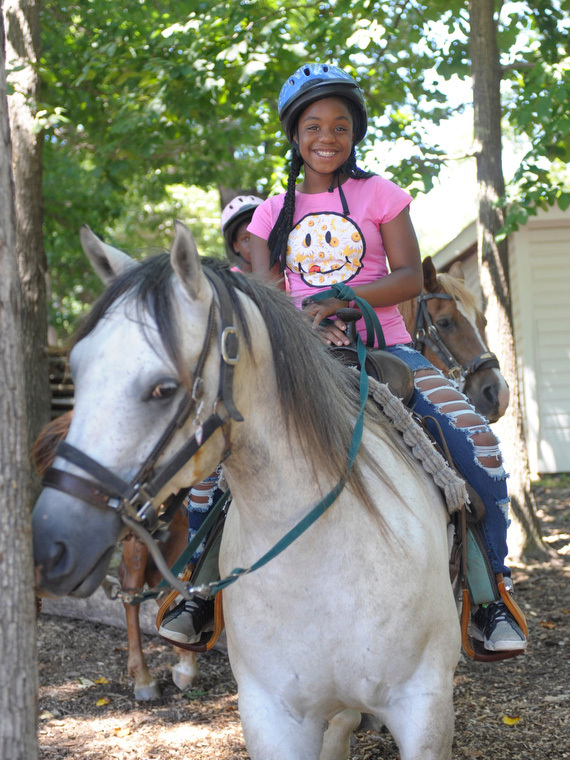 Participate in our volunteer program or make a reservation for the horseback riding adventure of a lifetime!